San Diego, CA - Autosplice Solderball Pin(TM) technology provides optimal co-planarity improving surface mount manufacturing efficiency of SMT Sub-Assemblies and Power Modules. Power Modules manufactured as a printed circuit board (PCB) sub-assembly are parallel stacked to a customer's host PCB. 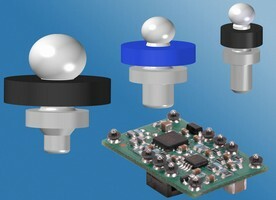 These mezzanine modules are representative of many other motherboard/daughterboard type assemblies that require interconnects with a high degree of mechanical and electrical integrity. Managing co-planarity variances between the PCB modules and motherboards during the final assembly process is critical to ensure that all contact points form robust solder joint connections. Solderball Pin(TM) technology supports the effective deployment of "Point of Load" power to the host PCB utilizing a highly conductive copper pin designed into a solder ball interface. Solderball Pin(TM) technology incorporates two important attributes that provide automatic compensation for PCB co-planarity variances up to .020"during solder reflow. The inherent design of Solderball pins allow PCB-based module designers the flexibility of determining optimal pattern and positioning of interconnects while maintaining design and layout consistency between new SMT versions as well as plated through-hole versions. The technology also provides a smooth transition roadmap of evolutionary product development and surface mountable product options. Power modules or other PCB-based daughter-board assemblies that are manufactured using Solderball Pin(TM) interconnects are processed as surface mount components ready for assembly into final products using standard automated placement and SMT reflow soldering methods. In addition to co-planarity compensation, Solderball Pin(TM) products are also offered in environmentally friendly solutions, meeting RoHS - WEEE "lead-free" requirements in STD EIA-481 packaging for high volume, cost effective automation on either standard or High Temperature Reflow processes. 3300P-100 TIR Prism Assembly supports telecentric optical system. Lead Screw Assemblies engineered for miniature applications. Fuse Holder comes with universal thru-hole clip. Spacers/Supports target PCBs or chassis-mount applications.